We got to the arts and crafts festival in Monroeville mid-afternoon, and parked behind the old courthouse, where they have the set for performances of To Kill A Mockingbird. “Lawyers, I suppose, were children once.” These words of Charles Lamb are the epitaph to Harper Lee’s To Kill A Mockingbird, a novel about childhood and about a great and noble lawyer, Atticus Finch. The legal profession has in Atticus Finch, a lawyer-hero who knows how to see and to tell the truth, knowing the price the community, which Atticus loves, will pay for that truth. The legal profession has in Atticus Finch, a lawyer-hero who knows how to use power and advantage for moral purposes, and who is willing to stand alone as the conscience of the community. The legal community has in Atticus Finch, a lawyer-hero who possesses the knowledge and experience of a man, strengthened by the untainted insight of a child. Children are the original and universal people of the world; it is only when they are educated into hatreds and depravities that children become the bigots, the cynics, the greedy, and the intolerant, and it is then that “there hath passed away a glory from the earth.” Atticus Finch challenges the legal profession to change the paradigm and make the child the father of the man in dealing with the basic conflicts and struggles that permeate moral existence. So, I have to say we were a little disappointed in the festival. There weren’t very many real artists there at all, and there were several people set up to sell (resell) things that were probably made in China and not at all suitable for a festival that billed itself as arts and crafts. By 3 or 3:30 most everyone was all packed up to go home. Y’all, even the barbecue we got wasn’t any good! He’s also represented at Black Belt Treasures in Camden – he’s got a coil basket here and a wisteria basket here. 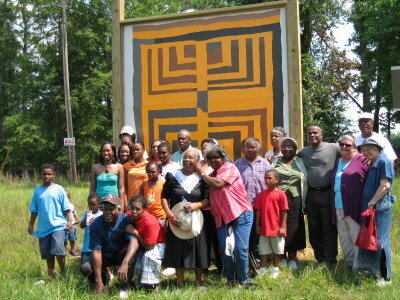 Tyree was also the artist that made the first of ten Gee’s Bend quilt murals last year. There’s a picture of it here. Several pics of the inside of the old courthouse, where TKAM is based, are here.